Koi Kaze, Rumiko Takahasi Anthology, Space Pirate Captain Herlock, and Stellvia. In the video game world, Darrel has some upcoming titles (TBA!) to be released soon. He has also voiced Wylfred in Valkyrie Profile:Covenant of the Plume, the Main Ceptor in Culdcept Saga, Taishi Ci in Dynasty Warriors 6, Nagamasa Azai/Mitsuhide Akechi in Warriors Orochi 1 & 2, Lekius in Dawn of Mana, Werman/Duran in Avalon Code, as well as various voices in Radiata Stories, Legendary and Turning Point:Fall of Liberty. Layle in the latest Final Fantasy Crystal Chronicles, The Crystal Bearers. The newest role is Winvene of the Cesedria kingdom. He has also done voiceovers for live action films, including Red Water with Lou Diamond Phillips, Witless Protection with Larry the Cable Guy, Bam Bam & Celeste with Margaret Cho, and the Korean comedy Attack the Gas Station. 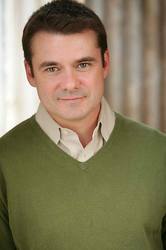 As an actor, he has had roles on stage, screen, TV, and in commercials. Most notably in Windtalkers directed by John Woo, Alias with Jennifer Garner, The Comeback with Lisa Kudrow, Gene Simmons Family Jewels, You Snooze You Lose with Jamie Farr, Saved By the Bell, Lauderdale, Silent Night Deadly Night Part 2, and Murder in Law to name a few. As a member of the Independent Shakespeare Company in Los Angeles, he has performed in Hamlet, MacBeth, Richard II, King Henry IV Parts I & II and The Tragical History of Doctor Faustus. Other stage credits include Hedda Gabler, One Flew Over the Cuckoo's Nest, The Three Sisters and Water Water Everywhere, which earned him a Valley Theater League A.D.A. nomination for Best Supporting Actor in a Drama.